For better or worse, designer and businesswoman Ivanka Trump has many qualities that resemble her father. Now add fashion feuds to the list. Following in The Donald's footsteps with his fallout with Macy's, the 34-year-old mogul has found herself in a dispute with a fashion brand. Italian luxury footwear brand Aquazzura, a favorite of celebrities from Kendall Jenner to Emma Stone, accused Trump of allegedly ripping off one of its designs. "One of the most disturbing things in the fashion industry is when someone blatantly steals your copyright designs and doesn't care," the brand posted on its Instagram. "You should know better. Shame on you, Ivanka Trump! Imitation is not the most sincere form of flattery." The shoe in question is a lace-up slingback with fringe, a style also adopted by Zara and Banana Republic. Trump calls her version the "Hettie sandal," and recently praised a fashion blogger for wearing a pair. While Aquazzura's shoes retail for $785, Trump's is a fraction of the cost at $145. The shoe is currently sold at Nordstrom. "We understand the importance of protecting the integrity of original designs, especially as they get interpreted at all price points," said a spokeswoman from Nordstrom. "We try to avoid duplications where we can." Mashable reached out to Trump for comment but received no response. As we've already read this past week, there are currently few laws prohibiting fashion copying in the United States, though social media has become a de facto way to police design copycats. 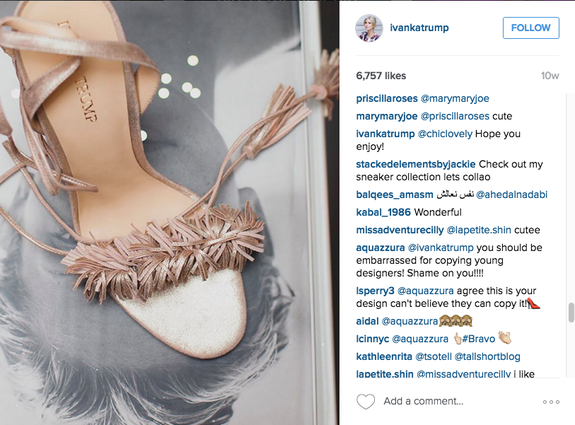 Already, numerous commenters have rallied behind Aquazzura on Trump's Instagram handle. The Italian brand itself even went so far to write on one of the designer's posts in January: "@ivankatrump you should be embarrassed for copying young designers! Shame on you!!!!"